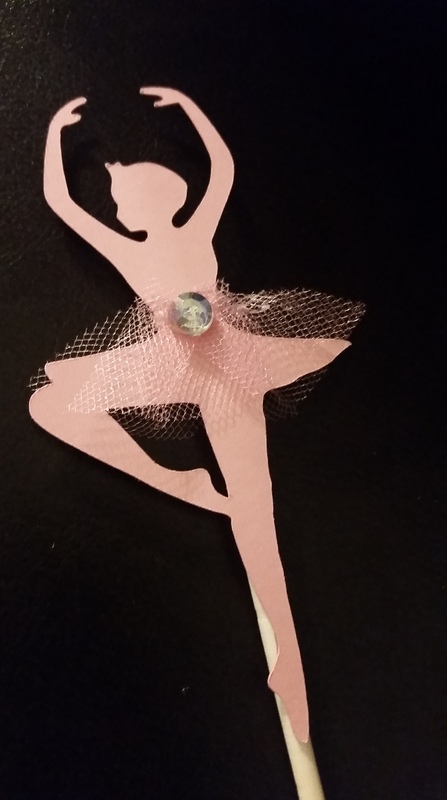 I purchased cardstock from Hobby Lobby and used a svg file I created in Illustrator to cut out the ballerina silhouettes. Click here to download the PDF file I used. *Note: this is saved as PDF, if using with Cricut, you will need to save it as a svg or as a jpg in order to upload it. Utilizing my Cricut Explore cutting machine I was able to cut out the ballerina shapes very quickly! (I am not endorsed by Cricut in any way, shape or form, I received the machine as a Christmas present and LOVE it!) After a little trial and error (the cardstock ripped on the tiara and hands the first time), I was able to successfully cut out the shapes using the “Light Cardstock” setting. 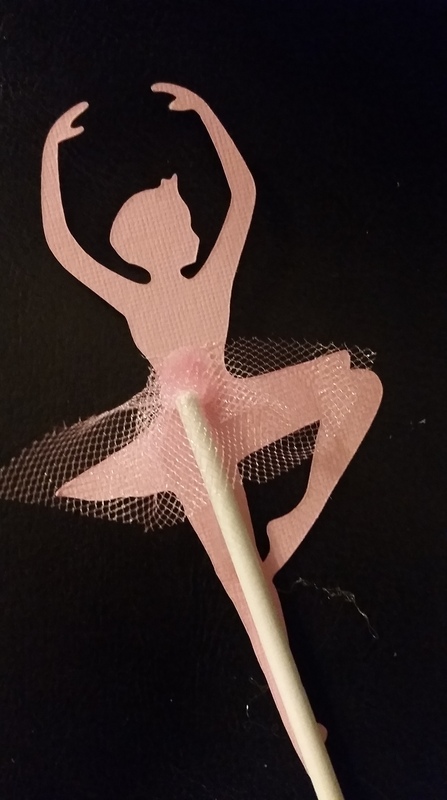 Next I used my hot glue gun on low temperature to secure the lollipop sticks to the back of the ballerina shapes. Make sure you glue the stick at least halfway up the shape for support. You don’t want a floppy ballerina! Once glued on, I then cut two little inch long strips of tulle. I placed a small dot of glue in the center of the figure’s waist (right where the top of the stick was). I secured each piece of tulle on the glue and then creased and folded it over until I had a tutu textured look. I overlapped the front and back piece to give it a more uniformed look. Lastly, I added another small dot of hot glue to the front for a rhinestone. After all, you can never have too much sparkle! Your daughter can steal the show at her birthday with our Prima Ballerina themed printables (all designed to match this same silhouette design). Click here to see the listing on Etsy. Enter coupon code BALLERINABLOG to save 10% on your order! Based on a picture of the centerpiece, custom Hello Kitty inspired printables were created to match including: water bottle labels, circle decals for cups, candy buffet and lollipops, candy buffet sign and small Hello Kitty images to place where needed (i.e. on the plate setting). Photos supplied by client.